To read it directly on the U.K's FabafterFifty web site (April 11, 2011), click here! Callanetics was incredibly popular 20 years ago. I know, I exercised to my old video until the tape became mangled in my old VHS player - finding a replacement proved to be impossible. I was so pleased to find out Callanetics is being relaunched in the UK, I bought a copy of the original programme on DVD at the Vitality show last week. Anyone who, like me, exercised to the original will still have those images of Callan Pinckney counting us through those barely there movements. I asked Callanetics if they could explain the benefits of the Callanetics programme to me. 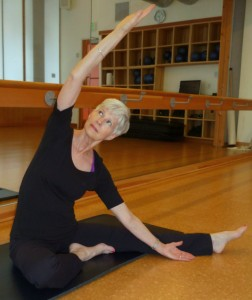 Judy (pictured), now 70, has been teaching callanetics since she was 50 - what a great advertisement for the programme! Judy, I for one, am delighted to see the new DVD become available, but why is Callanetics being relaunched now? We are now offering teacher training worldwide through our Home Study Program. The trainee is led through the training process beginning with the Traditional program and finalizing in the Evolution program. During the 20+ years since Callan developed this phenomenal program it has evolved, making the program even safer and bringing even faster results than ever before. What makes Callanetics so effective in a relatively short time period? Callan was a leader in creating a program that used small movements (which we call "pulses") while working in a relaxed manner. Keeping the entire body relaxed allows deeper work into the muscle fibers and keeping the non-targeted muscles relaxed provides more energy to the working muscle group. How Does Callanetics work? What is the principle behind Callanetics? The Callanetics Exercise Method works the body from the inside-out. Work begins from the pelvic floor muscles, which recruit the deep abdominal muscles as well as the deep intrinsic muscles that support the spine. As these muscles strengthen they eventually become a stabilizer of the spine, providing dynamic stabilization. While working in proper form, relaxed and in our peak position, we add tiny movements (pulses). We teach students to vary the style of pulses to create a 3-dimensional effect, engaging more muscle fibers and confusing muscle memory. Each pulse works the muscle in a different way, utilizing muscle confusion and enhancing body shaping. Why is this form of exercise particularly suited to women over 50? As we enter the menopausal years we often find that we have lost muscle tone, have a dropped pelvic floor, have lost the strength of the deep intrinsic spine support muscles and possibly have lost some bone density. A high percentage of my clients are in the "over 50" age category and have found that simply attending 2-3 Callanetics classes per week produces a tremendous change in 100% of them. Simply by developing the deep intrinsic muscles their posture is quickly improved, any back or knee pain is relieved or stopped and they are getting a full body workout without putting any impact on their back, neck or knees. Once they have taken classes long enough to understand the techniques we incorporate into our classes, their body takes this muscle memory into other phases of their life. They are able to re-enter the arena of hiking, skiing, biking or whatever activities they have done in the past. The Callanetics Exercise Method has given them their life back! What results should we be able to see and feel, and how quickly? It is common for students to see and feel results after only one class, and some after 2-3 classes. The results vary between students. It may be lifting the posture, drawing in the waist, erasing saddlebags, eliminating back pain, lifting the behind and/or losing a clothing size. Does The Callanetics Exercise Method create weight loss? No, it is not a weight loss program but it appears to be simply because women commonly reduce their clothing size quickly. The Callanetics Exercise Method increases lean body mass proportionate to body fat, resulting in a higher metabolic burn rate of calories per hour. This can profoundly restrict the body's tendency to produce fat tissue. How often and for how long should you do the programme? I recommend to my clients that they begin with 5 classes per week the first month and then they can reduce their classes to 2-3 per week. During the first month they are still learning to apply the concepts that we work with, including proper form, total relaxation and how to use the various pulses. Once their muscle memory has been developed they can reduce their classes if they desire. Although I recommend they start with 5 classes per week, I have many students who are not able to attend 5 classes per week and start with only 2-3. These students still get results, but on a slower path. I bought a copy of the original DVD, but I notice that there a several different versions now, can you talk us through them and which would be best for our age-group? I recommend CallaneticsEvolution for everyone. The Callanetics Exercise Method started with Callan's innate sense of safety and natural body alignment and over time evolved to include more body alignment principles, spinal mobility and safety and a deeper mind-body connection. The evolution of The Callanetics Exercise Method provides even faster results than ever, more safety for the back, neck and knees, and much quicker results. The common area we worry about seem to be our middles- how effective is Callanetics in addressing this area? The Callanetics Exercise Method works the abdominal muscles from the inside-out. It actually strengthens the deepest core muscles in the body, working into the entire abdominal muscle group. Being able to draw the belly in and up is the beginning of bringing the body into alignment and standing taller. Are there people who shouldn't follow the Callanetics programme? What about people with chronic conditions? Are there people who shouldn't follow the Callanetics programme? I work daily with clients who have chronic conditions such as back, neck or knee pain, inflammatory diseases such as arthritis and lupus, those who have had hip replacement or knee replacement and those who suffer from occupational or recreational injury. The program is non-impact and easy on the joints, tendons and ligaments, making it a comfortable exercise for most people. I always ask clients who are under doctor's care for any chronic condition to get permission from their doctor before beginning the program. I am not a doctor but am indeed an exercise instructor who can teach students to work in a way that does not put pressure or add pain on areas of concern. If you follow the Callanetics programme, should you also do separate cardio exercise. Or is Callanetics sufficient in itself? The Callanetics Exercise Method does not provide a cardio vascular workout. I recommend that students gravitate to a cardio workout that they love and this will encourage them to actually do it on a regular basis. It could be walking, working with the CardioCallanetics DVD, running, swimming, biking, etc. Typically what ages are the people in your classes? The age range of my clients is between 25 and 86, with the greatest participation in the range between 47 and 65. Our method of teaching includes a full demonstration of each exercise and stretch while students go into position. After completing the demonstration we move onto the floor and work hands-on with each student, correcting, modifying or intensifying them into a position that will give them the safest and quickest results. What results have you seen in your classes? So many that I can't list them all, but here are the usual ones I see on a daily basis. Tightened and flat abdominal muscles; improved posture; development of lean, firm legs; lifted and tightened behinds; elimination of saddlebags and freedom from back, neck and knee concerns. Keep in mind that all of this occurs while protecting their back and knees! I remind my clients that age has nothing to do with muscle development. An example would be a student entering the program at age 65 who has never exercised in her entire life. Her de-conditioned body can be guided to develop appropriate muscle memory and strengthen quickly from the inside-out! What difference has the Callanetics programme made to you personally? At age 35 I developed chronic back problems due to bulging disks which were a result of early life athletic injuries. This condition disabled me from participating in the outdoor recreation I enjoyed and prevented me from maintaining the healthful fitness to which I was accustomed. My journey involved years of exploring a multitude of fitness regimes before finding one that could accommodate my back problems. I finally found The Callanetics Exercise Method when I was 50 years old and am pleased to report that I no longer have chronic back pain. This program did not "cure" it, but has allowed me to manage it by strengthening the back support muscles. At age 50 when I began using this exercise method I lost 2 clothing sizes in 2 months (from size 10 to size 8 ) and over the next 6 months I lost another size (down to size 6). I am still a size 6 at age 70. I quickly eliminated my saddlebags and improved my posture. Is Callan Pinckney herself still involved? Callan, the leader of our phenomenal program, is now retired and enjoying life to its fullest! You can find out more about Callanetics at www.callanetics.com The latest Callanetics DVDs are available from amazon.